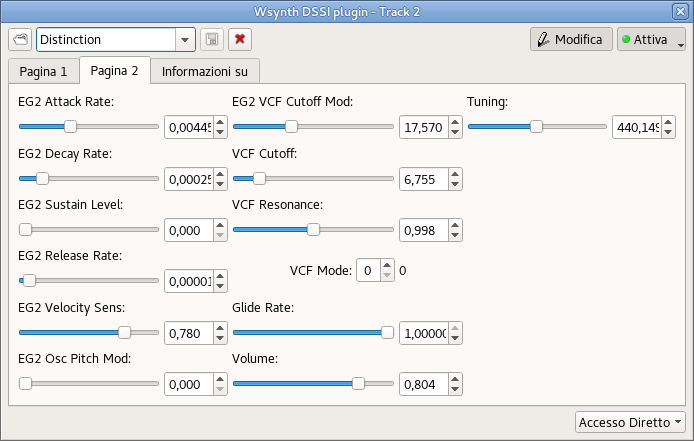 Wsynth provides DCO-1 and DCO-2 as sound sources, with discrete smooth detuning of plus or minus two octaves. 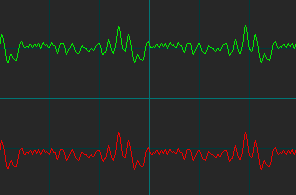 (Aliasing can be heard in the upper register in many presets; as such, Wsynth is especially good with lower- and mid-range note usage.) 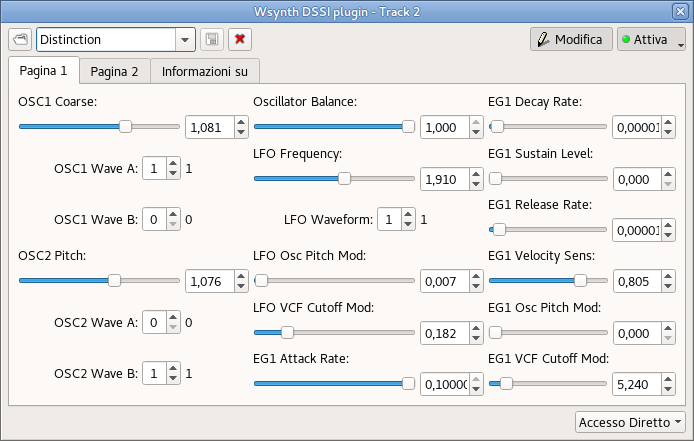 Each of these DCOs allows to select two waveshapes. 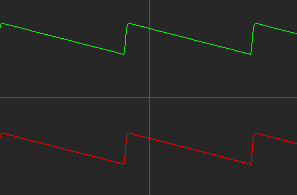 Filter and Resonance controls (use the Resonance settings with caution!) are provided for the two filter options: 24 db/octave and 12 db/octave. Below these controls are a level mixing knob to adjust the amplitude amounts of the two DCOs and a glide (portamento) knob. Slightly different than Xsynth is the use of the routings of the (ADSR-style) Envelope Generators EG-1 and EG-2. 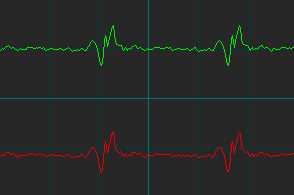 Both Envelope Generators provide velocity sensitivity and filter modification, and EG-1 is hardwired to overall amplitude. However, based on the EG-1 envelope settings, the EG-1 "Pitch Mod" setting will affect the amount of pitch deviation of DCO-2 (not DCO-1). 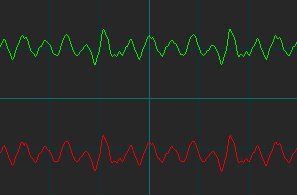 Instead, EG-2 includes a "DCO-2 Wave" knob, which controls how much of DCO-2's wave A is mixed into Wave B, based on the EG-2 envelope settings. (This knob is incorrectly indicated as "EG2 Osc Pitch Mod" in the Qtractor Editor GUI.) When this knob is set to zero, only Wave B of DCO-2 is heard. 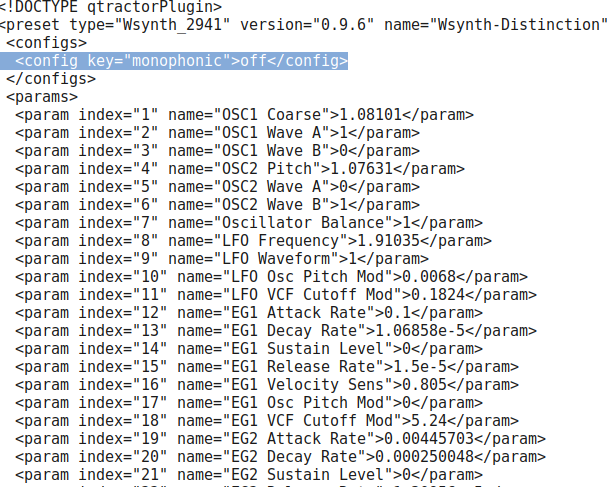 The LFO section of Wsynth is also slightly different than Xsynth. 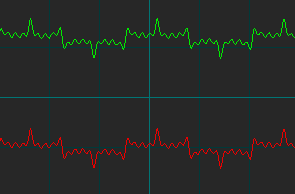 While it provides mostly the same LFO waveshapes (sine, triangle, saw up, saw down, square), the LFO "Pitch Mod" setting controls the modulation of only wave B of DCO-2. 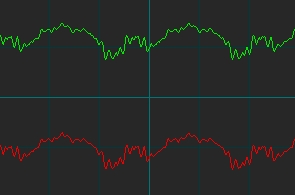 The "DCO-1 Wave" knob controls modulation between wave A and wave B of DCO-1 only. 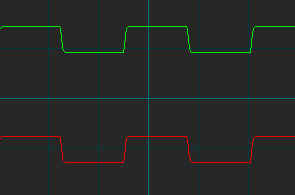 Like Xsynth, Wsynth's filter is hard-wired to MIDI Controller CC-01 (usually the modulation wheel). Modulating most presets using this controller will provide significant changes to the overall sound. 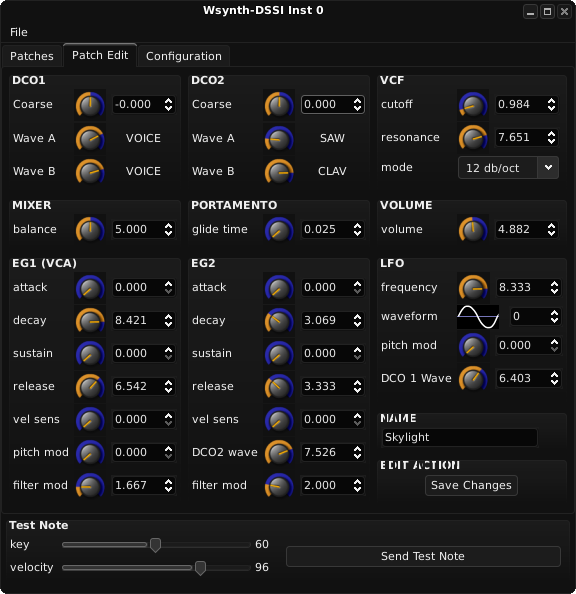 The 32-bit version of Wsynth can be run as a standalone instrument using Ghostess: type ghostess wsynth-dssi.so in a terminal to open the application, then click on the GUI button to open the native GUI with three tabs: the Preset Tab, the Main Synth Tab and the Configuration tab, which provides controls for tuning, mono-poly settings, and pitch bend range and legato settings. 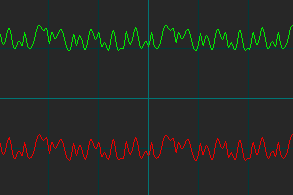 Audio output of Wsynth is mono. Wsynth Preset Collection-Qtractor-01 -A rolling collection of 48 presets, including some new ones, for use with Qtractor as host. This collection replaces the two other collections below. --Updated Apr.07, 2019. Wsynth Preset Collection-Carla -A rolling (81)-preset collection, for use with Carla as host. --Updated June 10, 2018.